Tres is a fun loving, adorable little guy who has become legendary for his nips to the backs of unsuspecting knees. Usually, it's just one nip, a taste if you will, and then he decides a person is OK. He loves playing with the other dogs, and being spoiled by the humans. He has the most fun, proud walk we've ever seen. His front legs go high in the air like he is a drum major strutting around. He generally has a look on his face indicating that he is quite pleased with himself. There is no lack of comedy with Tres around. 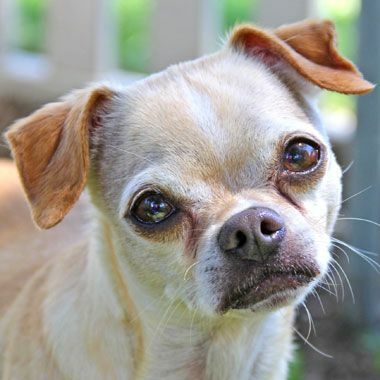 Tres was rescued from a puppy mill in Kansas many years ago. For reasons we don't know, he was never adopted. He spends his days in the sunporch with some of his best pup friends, begging relentlessly for tidbits from the staff and volunteers. He has his favorite people and loves them with all of his heart. HUA is his home, and he will stay here forever surrounded by humans who adore him.